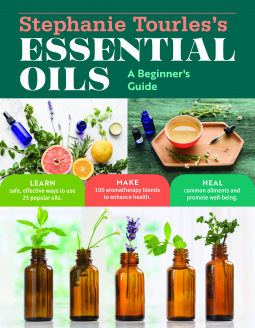 If you are new to aromatherapy, Stephanie Tourles’s Essential Oils: A Beginner’s Guide is a perfect starting point. She also lists 14 more oils that are nice to have but not essential. For each oil, the history, its natural state, safety warnings, and what it cures both physically and psychologically are listed. Finally, each oil contains several recipes for its use. These recipes vary between balms, massage oils, roll-ons, mists, sprays, dropper bottles, bath salts, gels, beverages, and nasal “sniffer” tubes. Each recipe includes how to use the result. Many include recipe modifications for children and warnings about when usage in not recommended (i.e., on open wounds or for asthmatics). The recipes include deodorant, breath spray, toothpaste, mouthwash, bathroom spray, lip gloss, insect repellent, flavored toothpicks, and body wash. There are recipes that cure an amazing amount of illnesses like headaches, backaches, sore feet, dry hands, menstrual cramps, and acne. The recipes also assist healing of flu/colds, sinus infections, insect bites, hemorrhoids, dermatitis, eczema, burns and other wound care. Some recipes give psychological benefits like energy, stress reduction, concentration and happiness. As the title indicates, this is a book only for those just starting their journey into aromatherapy. However, this book serves that reader well. It includes only the need-to-know information written in plain English—no chemistry degree needed. Most recipes need less than five ingredients. The in-depth coverage of a limited amount of oils mean the initial cost to try a few recipes would be lower than in more advanced books. If you are curious about aromatherapy, you should read this book. 4 stars. Thanks to the publisher, Storey Publishing, and NetGalley for an advanced copy.